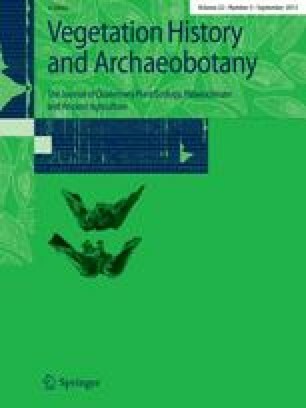 Analysis of flotation samples from twelve sites in Karnataka and Andhra Pradesh (south India) provides clear evidence for the predominant subsistence plants of the Neolithic period (2,800–1,200 cal b.c.). This evidence indicates that the likely staples were two pulses (Vigna radiata and Macrotyloma uniflorum) and two millet-grasses (Brachiaria ramosa and Setaria verticillata) which were indigenous to the Indian peninsula. At some sites there is evidence for limited cultivation of wheats (Triticum diococcum, Triticum durum/aestivum) and barley (Hordeum vulgare), and a few crops that originated in Africa, including hyacinth bean (Lablab purpureus), pearl millet (Pennisetum glaucum) and finger millet (Eleusine coracana). In addition there is evidence for cotton (Gossypium sp. ), and linseed (Linum sp. ), as well as gathered fruits of Ziziphus and two Cucurbitaceae. This evidence suggests that the earliest agriculture in south India, dating to the third millennium b.c., was based on plants domesticated in the region, and that subsequently from the late 3rd millennium b.c. through the 2nd millennium additional crops from other regions were adopted into the subsistence system. The authors wish to thank John Alexander, Chris Stevens, Alan Clapham and Dilip Chakrabarti for discussing an early draught of this paper. We are also grateful for the comments of K.-E. Behre and an anonymous reviewer. Special thanks to Leo-Aoi Hosoya for translating an article from Japanese (Miyazaki 1982). Some comparative material was obtained from the USDA, Agricultural Research Service germplasm seedbanks at Plant Genetic Resources Conservation Unit (University of Georgia, Griffin), National Seed Storage Laboratory (Colorado State University, Fort Collins) and North Central Regional Plant Introduction Scheme (Iowa State University); Kew Gardens Millennium Seed Bank, and the Museum of Natural History, London, where assistance in the herbarium was provided by Roy Dickery, Lucy Harris and Dylan Fuller. Special thanks to Steve Cafferty of the Linnean typification project, Natural History Museum, London, for checking on the synonymy of some species. Funding for the fieldwork portion of this research was provided by grants to DF from St. John’s College, The Smuts Memorial Fund of Cambridge, the Anthony Wilkins Fund of the Faculty of Archaeology and Anthropology at Cambridge University; to RK from Karnatak University; and to PCV from the Indian Council for Historical Research. RK gratefully acknowledges the United States Educational Foundation in India for permitting him to travel to the UK and work with DF during the first half of September 2001, and work on the final draught of this paper. The doctoral research of DF was funded by a Marshall Scholarship and a St. John’s College Benefactors’ scholarship, and carried out in the George Pitt-Rivers Archaeobotany laboratory of the McDonald Institute for Archaeological Research.